Decorating chalks can simply be brushed over an image, however, there are many other tricks and techniques that will extend the possibilities that these versatile palettes of color offer. The most straightforward way to apply chalks to a rubber stamped image is to use the chalks dry with an applicator. The dry chalk will not smudge or smear dry ink, therefore there is no need to keep close to the lines of the image. Some images are actually enhanced by the slight blush of color outside the stamped image lines and this gives a more natural effect. Applicators that are suitable for this technique include the applicators that came with the chalks, changeable tip applicators, cotton wool tipped swabs, pieces of cotton wool or other sponge tipped applicators. Special chalk applicators have small crocodile clip heads that will hold onto tiny cotton wool balls or pompoms. These are ideal for projects where lots of colors are used as it reduces any risk of color becoming contaminated through dirty applicators. Different applicators give a different finish. For instance harder applicators will give a more definite line, soft applicators such as cotton wool will give a much more gentle finish. Rub the applicator over the chalk a few times until the applicator is coated in the pigmented chalk powder and then rub this over the image. Chalks can be applied to a stamped image by using water and a paint brush. This gives a slightly different finish to that achieved when the chalks are applied dry. The wet chalk is slightly darker and less muted in shade. Any paintbrush can be used and the size will largely depend on the project in hand. A fine paintbrush is easier to use with detailed images where intricate lines and shapes require coloring. In addition to a paint brush, a cotton wool bud or another applicator will work equally well. To use this technique, dip the paintbrush into water and then rub the brush over the chalk. The water will not damage the chalk, although dirty or colored water will of course leave a stain on the chalk. Stippling brushes look like a traditional shaving brush and are used often used by artists. The brush is ideal for using with chalks and rubber stamping too as the soft bristles pick up the chalk and dust it lightly over an image. The brush heads are much wider than a paintbrush and are ideal for creating chalk backgrounds for projects. The stippling brush is used by rubbing the brush head over the dry chalks. As the head of the brush is generally larger than a cake of chalk, the brush is likely to pick up more than one color. This can enhance the overall finished effect. To avoid this happening, some chalk palettes have removable chalks. Chalks can be applied to a stamp, this will give a different finish yet again! This works well with solid stamps that have been stamped in a clear embossing ink. While the ink is wet, brush chalks over the stamp and then press it onto paper as normal. In addition to using a single color, different effects can be achieved by using a variety of colors, perhaps to create strips or to outline an image. 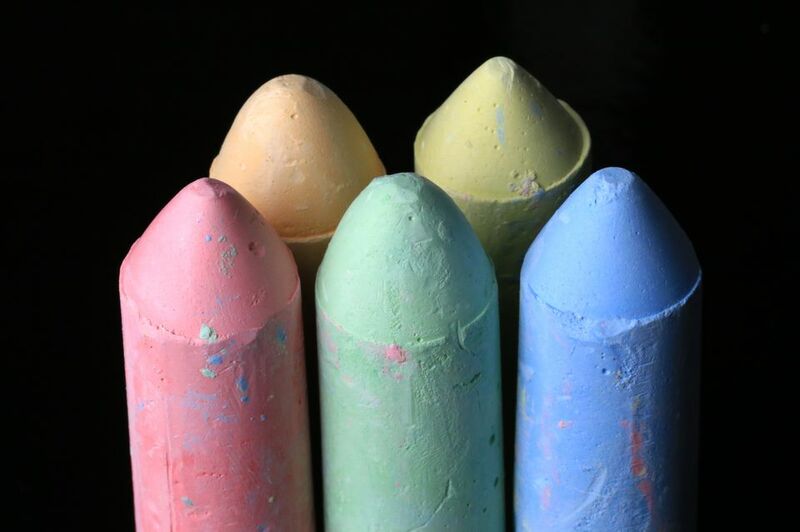 One of the best ways of exploring the different ways that chalks can be used is to experiment. Brush different colored chalks onto a clean piece of scratch paper, blending them into each other to create different colors. When you have achieved a finish or color that you particularly like, make a note of how this was achieved for future reference. Some chalks require fixing. Read the manufacturers instructions for more information. These are some of the key ways of applying chalks to stamping projects. However many stampers have their own special ways of doing this and have developed their own techniques through experimenting with different chalks and applicators. There are no hard and fast rules, so an ideal way to explore the technique further is to gather up some scratch paper and some stamps and start experimenting!